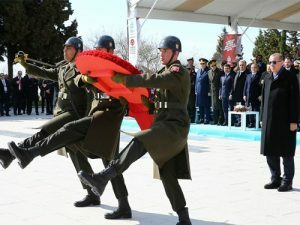 President Recep Tayyip Erdoğan attended a ceremony held at Çanakkale Martyrs’ Memorial on the occasion of the March 18th Martyrs’ Day and the 102nd anniversary of the Çanakkale Victory. After President Erdoğan laid a wreath at the memorial, a moment of silence was observed and the Turkish national anthem, the Independence March was sung. Deputy Speaker of the Grand National Assembly of Turkey Ahmet Aydın, Prime Minister Binali Yıldırım, Deputy Prime Minister Numan Kurtulmuş, Minister of National Defense Fikri Işık, Minister of Culture and Tourism Nabi Avcı, Minister of Energy and Natural Resources Berat Albayrak, Minister of Family and Social Policies Fatma Betül Sayan Kaya, Minister of Transportation, Maritime Affairs and Communications Ahmet Arslan, Minister of Youth and Sports Akif Çağatay Kılıç, Chief of General Staff Gen. Hulusi Akar were also present at the ceremony. Following speeches, highlighting the significance of the day, the Holy Quran was recited and prayers were said. President Erdoğan signed the memorial book and laid red carnations at martyrs’ graves.